The Movcam Mattebox MM1A features a 144mm rear opening and is compatible with lenses up to 14mm (35mm academy). 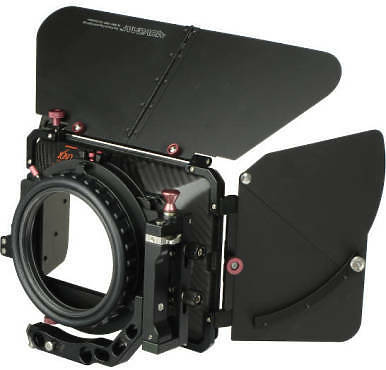 It is equipped with a 16:9 carbon fiber housing, a French flag and side wings for light control, one fixed / one rotating 4 x 5.65 inch filter holder, a 15:19mm bridge plate adapter and a 15mm mini swing-away bracket, and with a 144:114 rubber bellows that can optionally be stepped down. The swing-away bracket provides industry-standard 15mm rod support and the bridge plate adapter offers 19mm rod support. Two 4x5.65 inch filter holders. Compatible with 19mm rig systems. Main part made of Carbon Fiber to reduce weight. Including one top French flag and two fold able side french flags, which are matt processed to avoid reflection.